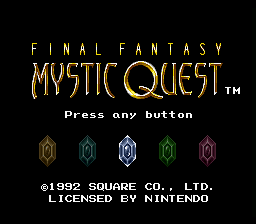 Ahhh, Final Fantasy Mystic Quest…first RPG I ever got. 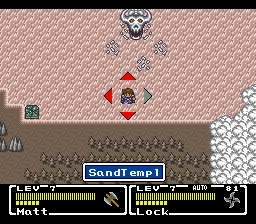 Anyway, FFMQ is a turn based RPG by Square in 1992 (USA). This game is often mocked because it doesn’t play at all like the other Final Fantasys did (Final Fantasy II for example which was released a year earlier). Also, the American version was dumbed down (made much easier) for the “less experienced” American gamers. 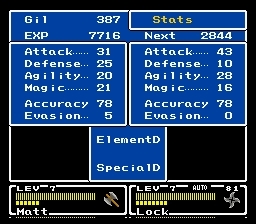 Despite this, the game features decent graphics (certain graphics surpassed FF2), an okay storyline (save the crystals, defeat the main enemy, etc. ), amazing music, average sound effects, some mildly challenging puzzles, tons of battles, a few challenging bosses, a handful of party members who help you as you continue your journey, and well, to simply sum it all up, an enjoyable game that for the experienced gamer, will give you 7-8 hours of gameplay. It’s always fun to replay in my opinion. Maybe not for the average gamer, but for the die-hard Final Fantasy gamer, it will hold their interest for a little while. This project came along when taarna32 and I were discussing games that need a good re-translation, and she brought up FF:MQ. She told me that tons of the names were translated incorrectly (giving me “Tristam” as an example, whose name is “Lock”, y’know, he’s a treasure hunter, picks locks, get it?). So thus, I took up the project. Tauwasser made a great utility for extracting/inserting the compressed font, big thanks go to him, if it weren’t for that, there’d be no MQ project! 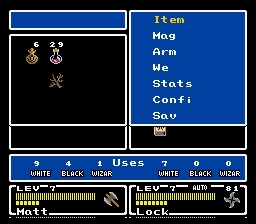 Thus far, about 99% of the items, locations and monsters are translated, amongst other miscellaneous stuff. 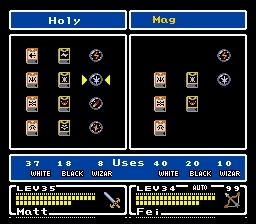 I took the “Auto/Manual” graphics from the US version, as well as the “White/Black/Wizard/Magic/Left” graphics. There’s still tons of work to be done, and I REALLY need a good translator. I respect this source material so much (*hugs his MQ cart*) and I’d love to see it get a quality translation. As you can see in the screenshots, there are some big space limitations to overcome, but those will be fixed in future patches. DarknessSavior Hacking Main Hacker, pre-liminary translator.